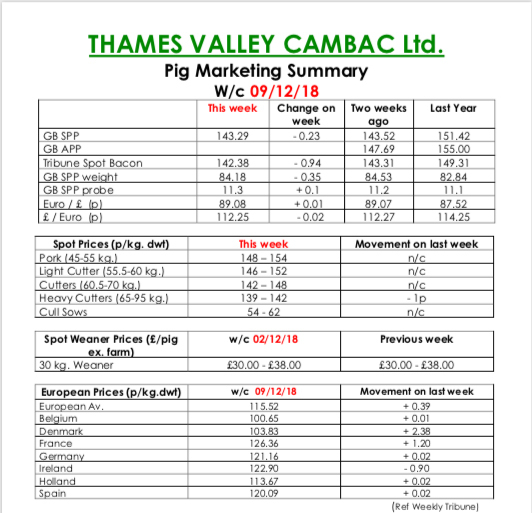 This week’s Slaughter Pig Marketing Summary from Thames Valley Cambac reported that it was another poor week for factory efficiency, with numerous issues causing downtime. This caused a good number of pigs to be rolled into this trading week. Most processors accepted on or around their contract commitment, but there was little sign of any festive improvement in demand. Prices eased again, with some contract contributions down a penny. With only 10 slaughter days left pre Christmas, there has been insufficient volume pulled forward, and we will go into the New Year with an excess of heavy pigs. The fresh meat market failed to pick up after last week’s malaise, with more than one outlet commenting that demand showed little improvement – a worry this close to Christmas. 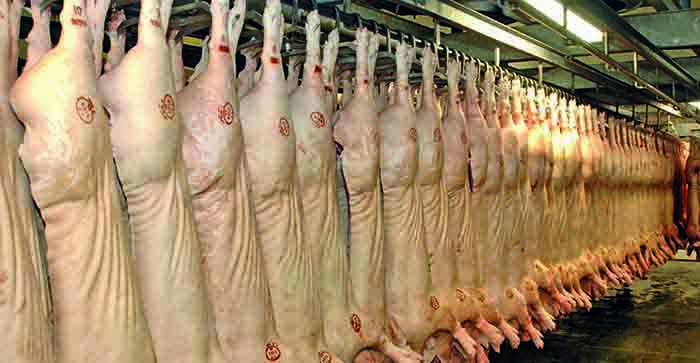 The cull sow market saw good numbers entered, and prices stood on. In Europe, Denmark and France saw better trade – up 3 and 1.5 euro cents respectively, and sterling ended the week very similar with the Euro at 87.08p. The Weaner Marketing Summary, for weekend commencing, December 2, reported that the market remained very difficult with widespread poor demand. Supply was ample, and enhanced by some breeder feeder operations wishing to make space by selling weaners in lieu of unmoved fat pigs. Prices struggled and some batches remained unsold. 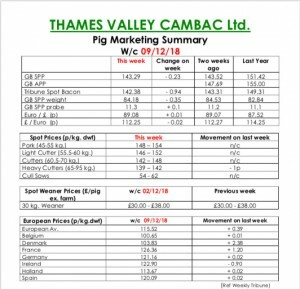 The prices announced by the AHDB saw no quote given for a 30kgs pig and the weighted average for a 7kg fall by £1.66 to £36.50.